Modern pool design is virtually limitless, and there are so many fun ways to create your own unique backyard oasis. From decadent designs to simple zen-like retreats and pools that double as art installations, these bodies of water are all extraordinary in their own way. Who wouldn’t want to pull up a lounge chair beside any one of these jaw dropping swimming pools? Posh resort Amangiri is hidden away in remote Canyon Point, Utah. It houses one of the most unique and beautiful pools in the world. Built at the base of a mesa, the award-winning pool curves dramatically around a giant rock formation. The line between natural landscape and man-made architecture are nearly blurred here, in perfect keeping with the resort’s design philosophy of blending in with the natural surroundings. Commissioned by publishing magnate William Randolph Hearst, the iconic Neptune Pool at California’s Hearst Castle took over a decade to reach its final form. It was redesigned and rebuilt twice during that period at the behest of the wealthy Hearst. The pool is known for its over-the-top design features — ornate statues and colonnades adorn the stone decks — as well as for its above average size. The Neptune Pool is more than 100 feet long, nearly 60 feet wide, and 10 feet deep at one end. Perched in the picturesque Santa Lucia Mountains, the Neptune pool can be visited as part of a tour, but is not open to the public for swimming. The expansive infinity pool at Hufaven Fushi resort in the Maldives has a particularly notable feature: fiber optic lights that glow like night-sky nebula. The effect is positively captivating, and the pool is like no other on earth. Creative lighting design — even if you don’t use fiber optics — can transform an ordinary pool into an incredible one. Small but stunning, this simple and elegant pool was built for fashion designer Jenni Kayne and her family. Kayne wanted a relaxing retreat that was also kid-friendly. This enchanting splash pool was the result. It is a study in simplicity, with clean lines and modest proportions. While it may not be as decadent as some of the pools on this list, it’s far from boring. Abundant plant life and a gorgeous water wall takes this California retreat to the next level. This pool is part of a nearly 8,000 square foot dream home in Singapore’s exclusive Holland Village. Called Tangga house, the property integrates architectural elements with raw natural features. The above-ground see-through pool wraps around two sides of the ultramodern designer home creating the illusion that the sparkling body of water floats impossibly atop the landscape. One of the most eye-catching pools on the planet is at The Library resort on the Thai island of Koh Samui. 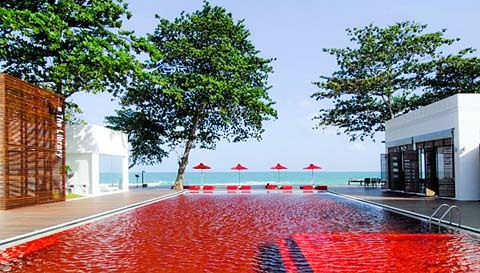 Ornately crafted with red, yellow, and orange Italian mosaic tiles and surrounded by a simple wood sundeck, the Red Pool sits within viewing range of Chaweng Beach. The crimson-hued pool stands out starkly against the understated, minimalist design of the Library’s all-white buildings. The Modern Resort in Honolulu, Hawaii boasts two signature pools, dubbed Sunrise and Sunset. Flanked by an earthy cool-wood deck, the Sunrise pool is surrounded by native plants and comfy lounge chairs. The aesthetic of the Sunrise pool is meant to be understated, blending harmoniously with the stunning natural landscape of Hawaii.